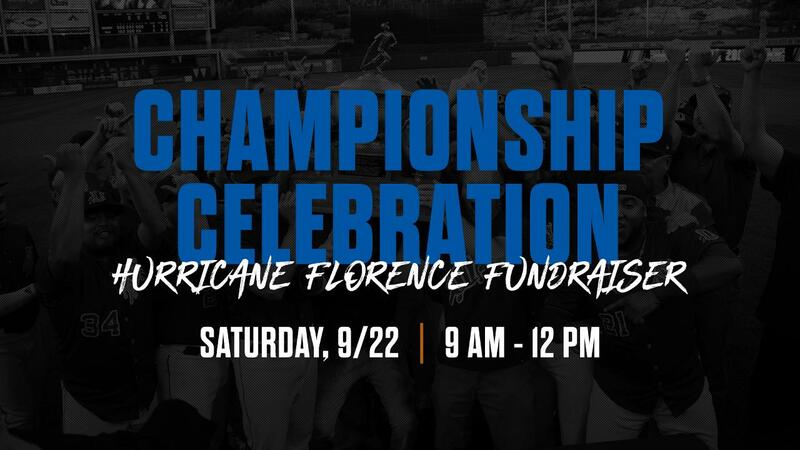 The Durham Bulls will host a championship celebration and Hurricane Florence fundraiser at Durham Bulls Athletic Park on Saturday, Sept. 22 from 9 a.m. to 12 p.m. The event will allow fans to take photos with the Governors' Cup trophy, take batting practice on the field and donate items or money to Hurricane Florence relief efforts. The event is free and open to the public. Fans who donate five or more items from this list will receive a ticket voucher for a 2019 Durham Bulls game at the DBAP, excluding April 11, May 4 and July 3, and fans can receive up to four vouchers per person. Fans who donate $50 or more to a charity on this list will receive a voucher to watch a game from the PNC Triangle Club in 2019. Fans must donate in-person on Saturday at the DBAP to receive a ticket voucher. Additionally, the Ballpark Corner Store will host a rummage sale, with all proceeds benefiting Hurricane Florence relief efforts. The Ballpark Corner Store and hurricane donation station will open at 9 a.m. The Bulls will also be celebrating the team's second consecutive Governors' Cup title, as the trophy will be on-hand for fans to take photos with. Further, fans will be able to order championship merchandise from the Ballpark Corner Store. Fans will also have the opportunity to take batting practice on the field, and select concessions stands will be open around the stadium. Batting practice will begin at 10 a.m.